This 12,500m2 new build school for 1700 pupils, had to be delivered to a very tight budget of £18.1m with a contractual requirement to achieve all relevant legislative and regulatory requirements, Building Bulletins as well as a BREEAM rating of “very good”. The Acoustician played a proactive role in achieving the acoustic contractual requirements stipulated on this project, without compromising quality, performance or budget. From previous experience acoustics is often considered much later in the design process, which can lead to less efficient design solutions which can inflate the cost unnecessarily. The real success of this project is the way that the acoustic design was considered from the outset and fully integrated into the design demonstrating the value in engaging the full scope of acoustic consultancy services from the outset. In some instances, the acoustic design dictated the architectural and structural appearance of the building. 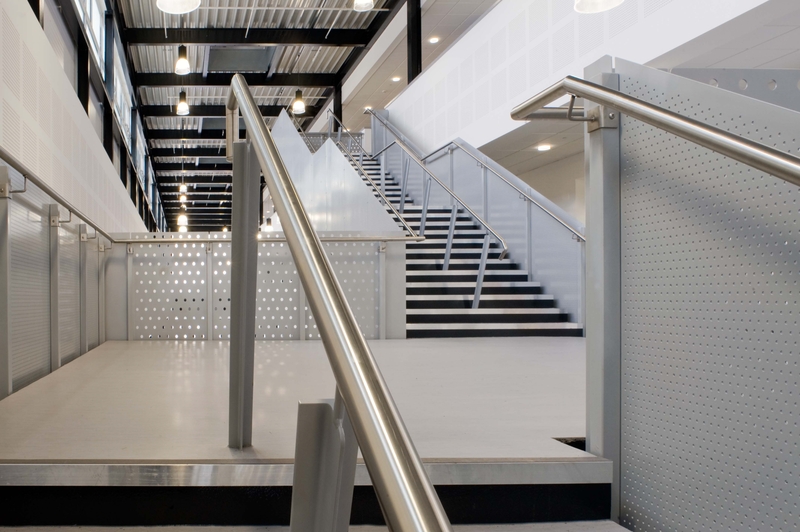 Such areas include The Street, Art and Design Technology Departments and the Sports Hall. The judges noted that a range of acoustic solutions had been employed and they were very effective in difficult spaces with a limited budget. It was most encouraging to see the integration of acoustics with the design from the earliest stage which had resulted in a successful acoustic environment being created. Talking to the architect at an early stage was an innovative element of this project and an approach which should be adopted wherever possible. The testimonial of the headmaster admirably illustrates why this project is the winner of the 2014 Architectural Acoustics Award: “I can honestly say the acoustics in our new academy build are of the highest standard. I have lost count of the amount of times visitors and staff have commented on the quality of sound. This is an open environment by design and the potential for noise pollution is great without an acoustic design which absorbs the noise and buzz of learning at its most potent. The Theatre is acoustically brilliant. Professional actors and performers never fail to comment on the quality of sound. The acoustic design is without doubt one of the most, if not the most, impressive aspect of this new environment”.